Since 1883, the BB has reached out to millions of children and young people through our partnership with local churches. At our peak, we were partnering with 3,110 Churches (that was 1962), today it’s fantastic that we are in partnership with 1,344 Churches in the United Kingdom and Republic of Ireland, building bridges into communities to engage with children and young people, bringing them into the life of those local Churches which we partner. At Brigade Conference held in Manchester in September we seized the opportunity to present some interesting research to those in attendance. This research was carried out by Youthscape, a Christian Youth Work charity. As part of this session we asked delegates to share their views and ideas about how the Brigade can use the findings to fill the confidence gap that the research has revealed in Church youth work and to consider what parallels we see in BB. Youthscape spoke to children, young people and adults in over 2000 Churches and the results will perhaps not be so surprising to you, but show how Churches are struggling to deliver effective youth and children’s work where they are doing this in isolation. Confidence. Our Church has never had lots of families and young people in it, and although we have a desire to see them in church we have no clear vision as to how that might be achieved”. 1. Churches especially smaller ones, do more children’s work than youth work. Unsurprisingly, the levels of youth and children’s work varied according to church size. Nearly all Churches offered some form of children’s work on a Sunday – 80% of small Churches (up to 50 congregants) and 98% of large Churches (150+ congregants). The same was not true for youth work – 89% of large Churches offered youth work on a Sunday, while only about 50% of the small Churches did. Only 14.3% of the churches surveyed have no young people at all in their congregation, so this cannot be due to no young people attending. In the survey the Churches were asked what types of activities they offer, less than half of the small Churches (0 to 50 congregants) offered recreational activities, with less than 30% offering any residential opportunities. Where uniformed organisations and Messy Church are involved in smaller Churches, then levels of youth work activity approach (and overtake) the levels of youth work in larger Churches. Question: Why is it that the Churches surveyed offer more children’s work than youth work? Is this the same in your Church? Are there any parallels in BB? Leaders feel more confident in working with younger children. Youth work can be scary. Churches more inclined to work with what they have got – under 11’s. There’s far more distractions and opportunities for young people, so they are less likely to attend i.e. football on a Sunday morning. Children’s work is the easier option! It’s a lot easier to attract children, often parents decision to get children involved. It’s possible on the odd night to throw together an Anchors/Juniors programme by opening the cupboard. You definitely can’t get away with this in Company/Seniors! Many of the same issues (as above)! In BB, I’m not sure if it is quite the same, as we tend to offer youth work in most Companies (i.e. have a Company/Senior Section), but the big question would be is the leadership appropriate and programme attractive enough to see young people consistently coming through the door? Not in all Companies I doubt. 26.4% of Churches said their youth work was ineffective, whilst 12.1% said their children’s work was ineffective. 41.4% of the smallChurches (0 to 50 congregants) surveyed said their youth work was ‘ineffective’. Linked to the quality of work 75% of Churches don’t engage with young people about topics like mental health, sexuality, relationships, drugs, alcohol, social media and family life – all topics that young people surveyed indicated were important to them and ones they wanted to discuss. Question: How would you rate the effectiveness of youth and children’s work in your Company? What are you looking for? What do we need to do to improve? 3. Churches know that they are struggling with their youth and children’s work but don’t know how to fix it. The churches appeared desperate when asked about their needs; many referenced the need to simply start youth or children’s work, or to attract some children and young people in the first place. When the Churches surveyed were asked what organisations and resources they used in their youth and children’s work, we were delighted that the BB was in the Top 10! (so a pat on the back there!). Other organisations and resources featuring in the top 10 included Scripture Union, Urban Saints and Youth for Christ. “Our aim in writing this report was to highlight the reality of youth and children’s work in many Churches across the country. We’ve discovered that many Churches are struggling to offer activities for children and young people, and aren’t sure how to begin. When new BB work starts in a Church there is a clear vision, purpose and commitment that sees the movement as integral to that Church’s mission outreach to the local community. We believe it is critical for the success of both Church and Company to continually strengthen their relationship and work together. For many of our existing Companies that commitment between Church and Company happened many years ago, often before present leaders became involved. As with any partnership it is important that we regularly review what we are seeking to achieve together. 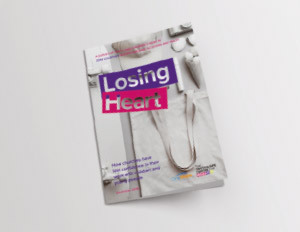 As the ‘Losing Heart’ report shows the Church is experiencing increasing difficulties getting young people through the doors. 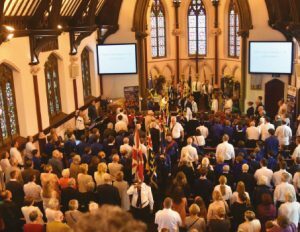 Yet each week The Boys’ Brigade works with thousands of children and young people, and for many of them The Boys’ Brigade is their only connection with the Church. It does this by PARTNERING the church in outreach, SUPPORTING leaders and ENGAGING children and young people. ‘Faith in the Company’ a fantastic resource for Churches and Chaplains aimed at strengthening the relationship between BB and the Church. ‘Company Health Check’ to help you identify what is going well and what you need to look at. We hope that you will take the opportunity to consider the shared role in mission, and that through this more children and young people will come to know Jesus for themselves.